Is social media in general and Twitter in particular speeding up the news cycle? 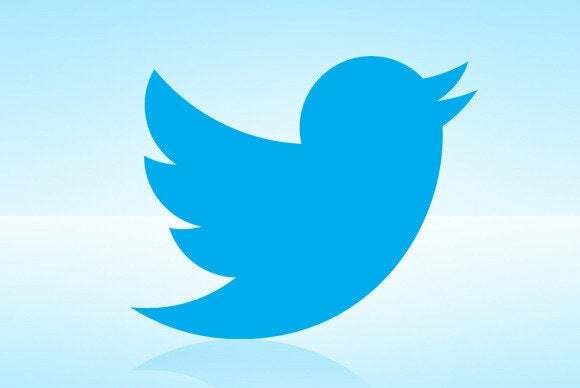 Twitter posts related to the shooting last week of Michael Brown in Ferguson, Missouri, started appearing a full two days before cable news outlets like MSNBC, CNN and Fox News put the story in prime time, according to a report published Wednesday by the Pew Research Center. Roughly 146,000 posts related to the shooting were published to Twitter on Saturday, Aug. 9, the day Brown was shot and killed by a police officer, Pew researchers found. MSNBC and Fox did not devote prime-time coverage to the shooting and the surrounding events until Monday, with 21 minutes and 6 minutes of coverage a piece, respectively. CNN began its prime-time coverage on Tuesday, with 24 minutes. The researchers at Pew examined three hours per day of prime-time news programming for the three cable TV news networks between Aug. 9 and 15, as part of the Washington, D.C.-based research center’s Journalism Project. Their findings show that while Twitter may have broken the news first, the rate at which people posted and at which the news networks covered the story eventually increased at about the same clip. “The story emerged on Twitter before cable, but the trajectory of attention quickly rose in tandem, peaking on both mediums the day after two journalists were arrested and protests turned more violent,” researchers said in their findings. By Thursday of last week, there were roughly 3.7 million tweets related to Ferguson, and more than two hours of coverage on MSNBC, according to Pew. Researchers also observed that over the course of the first six days of the story, MSNBC devoted five hours and 42 minutes to it—the most of the three major cable news networks. CNN spent just under four hours on the story and Fox News nearly three hours, but Fox rallied as the story grew and was matching CNN’s daily output on Friday. 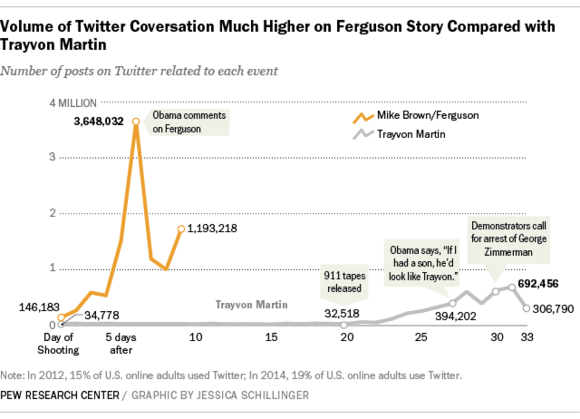 Researchers at Pew compared tweets around the events in Ferguson, Missouri, to tweets around the shooting of Trayvon Martin two years ago. Pew also compared Ferguson-related Twitter posts to activity on Twitter around the fatal shooting two years ago of Trayvon Martin in Sanford, Florida. Parallels have been drawn between the two because like Brown, Martin was an unarmed black teenager, shot and killed in the street by a white man. There were far more tweets related to the incident in Ferguson compared to the Martin shooting, and they grew much more quickly, Pew researchers found. The number of tweets related to Ferguson topped out at 3.7 million around the time that President Obama spoke on the events five days after the shooting. Two years earlier, there were less than 400,000 tweets when Obama spoke on the Martin shooting, and that was nearly a month after it occurred. The number of tweets related to the Martin shooting topped out at less than 700,000, researchers found. The findings speak to how quickly people today consume and interact with news on social media. But researchers did not make any conclusions around what drove the increased Twitter activity for the events in Ferguson. To be clear, the two events developed differently as news stories. Martin’s shooting did not set off the same firestorm of protests and police reaction that demands media coverage and the National Guard was never deployed in Florida. Other events in the news around the time of Martin’s shooting, like Russian protests against Vladimir Putin, may have also diverted attention away from Florida. At around 271 million, Twitter has roughly double the monthly active users now than it had around the time of Martin’s shooting.